Mala Bryan has been in NYC for the last few months but certainly not laying low. In the September collector's edition of Essence Magazine that hits newsstands now, Mala has a 6 page spread. This issue has "The Obamas" on the cover. 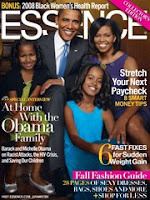 ESSENCE became the only Black publication allowed a glimpse into the Obamas’ spacious Chicago home. Barbadian pop singer, Rihanna also graces the pages in this issue: click here. Even write ESSENCE expressing your joy! ..And Mala, CONGRATS, I am so proud of and happy for you! Mala looks absolutely stunning on this spread!!! !